As some of us face another hot, humid Pennsylvania summer or a long season of 100+ degree heat here in the Arizona desert, let’s imagine instead chilly temperatures, snow and ice skating. For years, the Sharon-Sharpsville area community enjoyed boating, fishing, swimming, and ice skating on Lake Julia, at Buhl Farm Park, named after Julia Forker Buhl, the wife of the park’s founder and donor, Frank H. Buhl. 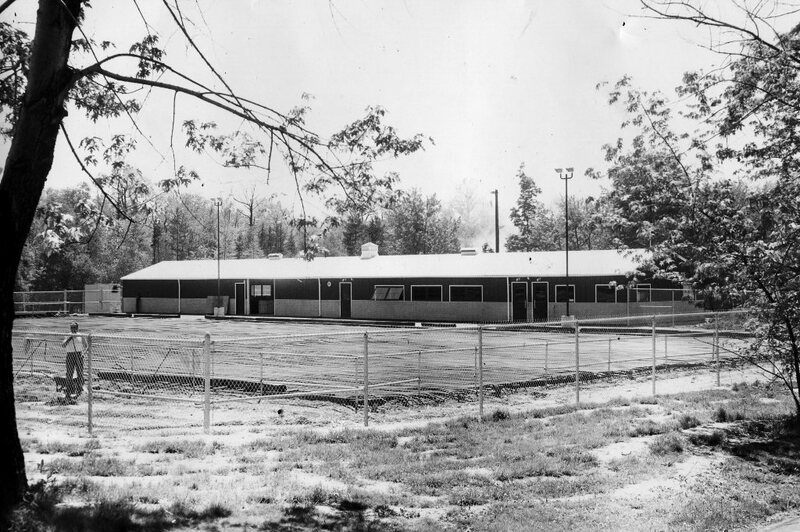 Then, in 1969, a skating rink was built to the east across the road from the Buhl Park Casino, the columned two-story building that overlooks the lake. When the rink came in, skating was no longer allowed on Lake Julia. This new rink was gone by 1985. Happily, ice skating returned to Lake Julia on February 22, 2015, and it’s again a highly popular place for people of all ages and skating skills, often along with their dogs. Eric Bombeck kindly contributes the following remembrance which originally appeared in his senior shopper newsletter, The Way It Was. Check it out on Facebook: “The Way It Was/ Senior Shopper – Mercer County,” the companion page to the newspaper. Enjoy the read and stay cool! Ice Rink at Buhl Park, Hermitage, PA, under construction, c. 1969. The average snowfall for the month of March in the valley is about four inches. When I was a kid in the 70s, it was my favorite “winter” month to play outside because it was snowy, at least at the beginning, but still warm. We moved to Ninth Street in Sharpsville from Wheatland in 1965 when I was four. Our house (my dad still lives there) is less than 50 yards from Buhl Park. The park was a winter wonderland, one I didn’t truly appreciate until I moved away. 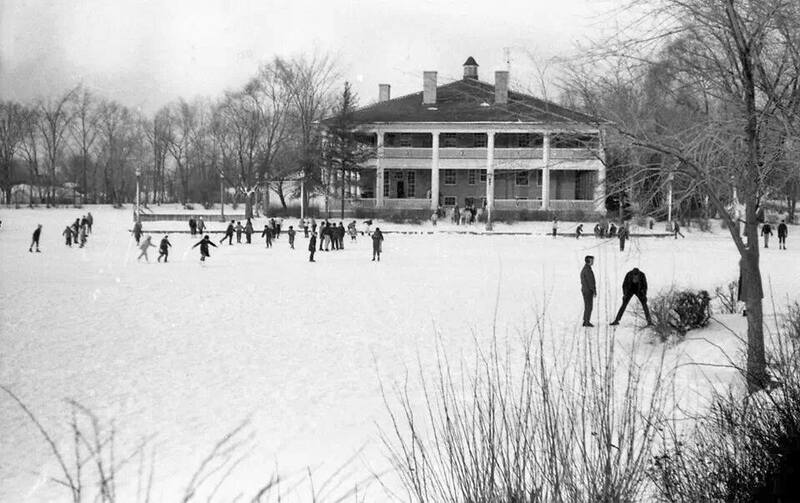 In the late 60s, before they built the Shenango Valley Ice Rink in 1969, you could still skate on Buhl Park’s Lake Julia. I had double runner ice skates that went over top my of my shoes that I’m pretty sure were from the thirties, maybe even older. You couldn’t really skate in them, you had to run and then slide. It was a lot of work. Skating on the lake was the last vestige of the old days when people boated and even swam there. Then, the new ice rink was built. (The current bathroom and maintenance shed at shelter number four is the back end of what was then the skate shack.) I remember that it always smelled the same in there, like leather and metal and hot chocolate. I can’t explain it except to say I have never experienced that smell since. I don’t remember what it cost to get in, maybe a buck and a half or two, and fifty cents to rent skates. That Christmas, after the rink opened, a pair of brand new skates appeared under the tree. I was now a citizen. The rink was a valley melting pot, which is code for… there were girls from all over town there! The skate house had long rows of wooden benches, a place to rent skates, and machines where you could get a snack. The hot chocolate machine was very popular. There were skate guards there who wore red jackets and patrolled the ice. Dennis Racketa was one, until the place closed around 1980. He says the guards weren’t paid a dime to work at the rink; their only payment was skating free. Each night before the rink opened, the Zamboni machine would clean the ice and then the guards cleaned out the corners with shovels. Once the doors opened, the guard’s job was to keep us kids from getting too rowdy and that included preventing us from snapping the whip. Two people held onto a long scarf and the guy in the front would whip the guy or gal in the back around really fast. I remember more than once seeing some unsuspecting skater, looking like a deer in the headlights as the guy or gal was being whipped right at them; a collision imminent. If you ran afoul of the skate guards, you could be sentenced to a “time out” off the ice, in the skate shack. Dennis says exceptionally severe winters (remember the blizzard of ’78?) and the opening of the roller rink in town doomed the rink at the park, a mere decade old. When skating got old, you could go sled-riding down “Pork Chop Hill,” located at the top of the kite field on the top of Hazen Road. Franny Perfett and I did it all the time. I remember putting plastic sandwich bags over the first pair of socks and then putting socks over those. I’m pretty sure once snow got inside the “baggies,” it just kept the moisture in, making it worse. When the conditions were right, you could sled down the road and one time I ended up at the road in front of the park’s Casino, the longest ride ever! 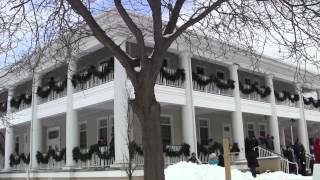 The memories are endless…Kevin Frankovich and I hitting golf balls across the frozen lake, climbing trees in the park and throwing snowballs at cars (dumb because there was nowhere to run.) Dennis Racketa reports his skate guard jacket from the rink at the park still hangs in the back of his truck to this very day. It all seems like so long ago…then again maybe not. — Eric Bombeck (Sharpsville H.S. 1979), South Pymatuning, PA. June 2017. Great stuff. There was a reason the ice rink was taken down and sold. A reason I believe some people who were on the board of Buhl Farm at that time would not want the reason to be known.